What do you get when you cross a deer with a blackbird ? Can’t say I know the answer to that but these two lads are definitely working on it for me. Animal researchers of the world take note, there could very easily be some flying deer hovering around the Phoenix Park in the next couple of years. 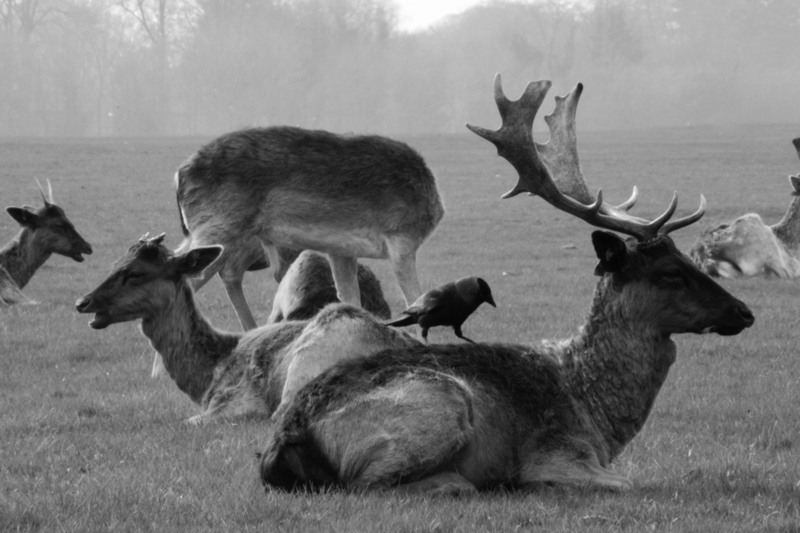 Every time the blackbird sat on the deers back I would obviously have the camera pointing in the wrong direction. There were literally hundreds of deer sitting around this area at the time, I spent at least an hour sitting patiently for something interesting to happen. The deer are very much happy with a bit of human attention, so long as you don’t go running and shouting at them, they will sit perfectly still and allow you to get quite close to them. Sometimes I like to simply sit and watch them go about their business in the park, leave the camera in the bag and just enjoy this amazing piece of nature so close to the city centre. It’s hard to believe you are literally only a couple of miles away from a busy metropolis. For anyone unfamiliar with the Phoenix Park these lads just wander around freely in large herds, along with the trees, they pretty much own the place. They are never that hard to find, just drive up through the main road and keep your eyes peeled for them. So now you know, it’s not only trees that catch my attention ! This entry was posted in Black and White Photography, Infra-red Photography, Irish Landscapes, Phoenix Park and tagged Black and White, Phoenix Park, Photography. Bookmark the permalink. Thats an awesome shot………. Strange Shot too lol!……… but overall awesome……. Truly was one of the stranger things I have come across in the park so far. Hey anytime……… I’m gonna definitely be looking out for some more of your shots…….